Some of the most common questions when shipping goods internationally are listed here. If you cannot find and answer to your question, please Contact Us so we can help you solve your problem. Q:- Where can I send Alcoholic Beverages? Please check with our Customer Service, as each country has individual requirements and restrictions. Q:- What does Free Domicile/DDP mean? A:- A term where a consignment is delivered and the receiver does not pay any charges. This often happens when a product sample is sent and any additional charges such as Customs duties and taxes are paid by the sender. This is an internationally recognised term of trade stating that all customs duties and taxes incurred on a dutiable item will be billed to and paid by the sender/shipper. To take advantage of this service, the connote should be marked by ticking the appropriate box or writing Free Domicile/DDP clearly on the Consignment Note. An accompanying Customs Declaration and Commercial Invoice must also state this terminology. If the receiver is to pay the duties and taxes, the request is invalidated. Jet Worldwide recommends that you advise the receiver of these arrangements prior to shipping to avoid any delays or problems. Q:- Why is a CD/DVD (computer disc/digital video disc) considered as non-documents? A:- Customs Services in some countries list these items as dutiable because information other than word documentation can be stored e.g. Video Movies, Music. Q:- What is a Censorship Board? A:- Most countries have a Censorship Board which monitors and randomly stops for inspection, the shipment of CDs, Videos, DVDs, computer disks, magazines, books or other related visual material. These kinds of shipments may contain pornographic or culturally offensive materials and as such are stopped from entering their countries. The Censorship Board can delay items for a period of one or upto six weeks. Q:- Why do I need to list everything that I am sending? A:- When sending goods that are not considered documents, each item needs to be listed. Please see a copy of our guidelines and customs declaration form to see what is required. 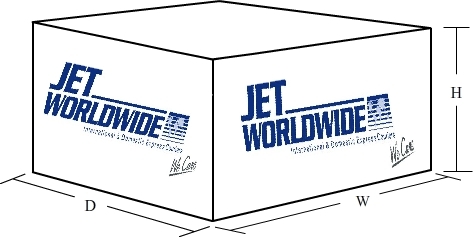 Jet Worldwide recommends that you complete all necessary paperwork for all your packages to help prevent delays or problems arising with your shipment. A:- Many countries have different requirements and regulations. The following is a guide only. Animals including insects, pupae, worms, fish, hatching eggs and birds. Counterfeit or Pirated goods or material. Dangerous Goods, hazardous or combustible materials. Dry ice is acceptable in limited quantities and to certain countries. Firearms, or parts of weapons and ammunition. Negotiable Instruments in Bearer Form. Any items that may be notified by the Customs Services as unacceptable. This list may change periodically and without notice. All Film Types & PurposesTypes: 8mm, 16mm 35mmPurposes: Promotional, training, viewing. No Pornographic material is allowed under any circumstance. Cosmetics - nail polish, perfume or any items containing alcohol are deemed dangerous goods by IATA and the Dangerous Goods Association and are not allowed to be sent. Costume Jewellery, which is not real jewellery and has a value below 200.00USD. Watches over 2000.00USD are deemed to be jewellery and are a prohibited item. Chemicals Non-Hazardous - if deemed as non-hazardous by IATA and the Dangerous Goods Association. A Safety Data Sheet must accompany all shipments together with a Commercial Invoice or Customs Declaration stating the true value. Animal products, plant products and plants e.g. animal skins, cotton, seeds, tea, tobacco. Antiques/Fine Art/Works of Art - for shipments worth more than 500.00USD, Jet Worldwide requires an independent proof of value to be presented before shipment. The package must also be professionally packed and organised by the shipper. Collectible/Irreplaceable Items - for shipments worth more than 500.00USD, Jet Worldwide requires an independent proof of value to be presented before shipment. The package must also be professionally packed and organised by the shipper. 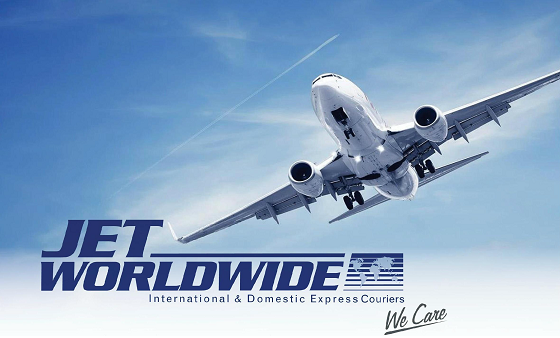 Shipments worth more that 10,000.00USD must be checked with Jet Worldwide Customer Service to ensure the shipment can be sent via the Courier Service. Fur(s)/Ivory/Endangered Animal Products - Several worldwide laws and conventions limit the movement of these commodities. Medical samples e.g. biological/diagnostic specimens, blood, urine, body fluids and tissue samples may only be carried if they are not classified by the IATA as Dangerous Goods. Watches and costume jewellery. Individual values may not exceed 100.00USD and a total consignment value may not exceed 25,000.00USD.